Fall is my favorite season. The leaves change, buy the weather starts to cool, you catch the first whiff of fireplace and warming Fall foods fill the kitchen. Since I moved to Miami, I’ve had to give up most of the above, but I get to keep my favorite Fall foods. I just love the sweet/salty/spicy flavors of cranberries, dried apricots, chestnuts, turkey, sage and pumpkin. So, I combined all of these favorite Autumnal ingredients into one delicious Autumn Turkey & Pumpkin Lasagna. Instead of ground beef, sausage and marinara, this lasagna is full of ground turkey sauteed with dried cranberries, dried apricots, green onions, smoked paprika, sage and roasted chestnuts. Pumpkin and ricotta spiked with cardamom add a nice creamy layer in between the flavor-packed ground turkey. The lasagna is topped with the traditional mozzarella cheese and baked until brown and bubbly. And it tastes just like Thanksgiving. Just like Autumn. If I close my eyes and jack the A/C way up, I can almost imagine the cool weather and changing leaves. But if I look outside, it’s still bright and balmy, palm trees and sandy beaches. I’ll just have to get my Fall fix from more lasagna. You can substitute pureed butternut squash, or any other Fall squash, for the pumpkin. Begin by browning the turkey over medium heat with the olive oil. Once it’s cooked through (about 10 minutes), add the cranberries, apricots, green onions and paprika. Continue to saute for another 10 minutes, then stir in the chestnuts and sage leaves. Remove from heat and set aside. While the turkey is cooking, combine the pureed pumpkin with the ricotta cheese and cardamom. Set aside. Preheat the oven to 375° and begin to assemble your lasagna. 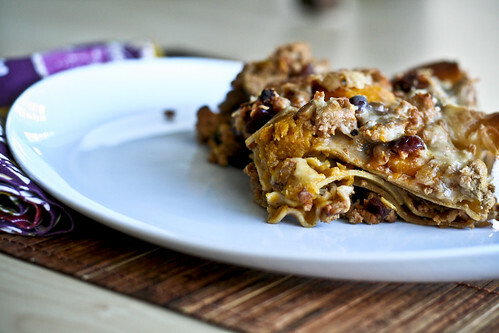 Start with a layer of lasagna noodles, then turkey, then noodles, then pumpkin. Rinse, repeat. When you’ve used up all of your turkey, pumpkin and noodles, top the lasagna with mozzarella cheese and place a few sage leaves on top. Bake for 35 – 40 minutes, or until the cheese is brown and the lasagna is bubbly. Let stand for 10 minutes, then slice and serve. What a fun recipe! I know what you mean about jacking up the AC. We’ve been in the 90’s in SoCal for several weeks now. Where’s fall?? Ayyy.. How I miss Florida!! I am still adjusting to the cold weather! Fall is absolutely gorgeous though, I would not trade it for the Florida weather. The problems begins when the real cold kicks in and the slippery sidewalks… Then I long for home! This recipe sounds delish! Will have to try it and possibly take it to Thanksgiving dinner. ooh, cardamom! I should’ve thrown that into my butternut spinach lasagna rolls :) looks fantastic! Melissa, I think you are reading my mind! I was craving pumpkin pasta or something in that area but besides a creamy sauce for pasta, I was coming up with poor choices. Then you post this delicious and somewhat healthy pumpkin dinner, and I couldn’t be more pleased. I think I might add in some butternut squash and maybe some asparagus… I love fall, and all things related to it so I can’t wait to try my hand out on this dish. One question though: texture-wise, did the lasagna get a little soggy with the pumpkin or did it hold up ok? Ooh, I love the addition of dried cranberries and apricots. What a perfect, fall feast! This looks like an excellent lasagna. 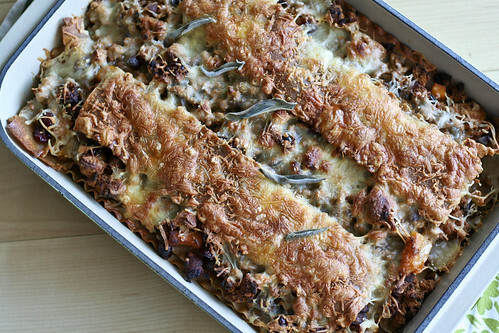 I love any and all things Thanksgiving and this dish combines all that goodness in one dish! Thanks for the idea, the pumpkin addition sounds great. I’m working on a slew of pumpkin recipes that I’m posting now….I’m so addicted to it! Amanda – It wasn’t soggy at all, but I think it’s because I used canned pumpkin. If I had used fresh pumpkin puree, I think I would have strained it in some cheesecloth first. This looks good. I doubt I’d have been able to come up with this idea. I am using whole grain pasta more, it has really improved over the last few years. What a great idea for a lasagna! It looks so good! It’s early October and up here in Chicago the weather’s getting cooler, the days are shorter and the leaves are turning. I’ve been saving this dish for a weekend supper and finally got around to making it last Friday. In short – the recipe rocked! Not only did I get my pumpkin fix, but a hearty fix at that. The seasonings for the turkey were right on (even if I was hesitant about the chestnuts).. I ended up using no-cook lasagna from Trader Joes in the dish and it worked out great (and saved a step). I’ll probably use less cardamom next time because I realized I’d need less of a fragrant flavor, and I added some salt to balance out the sweet– but this recipe is definitely a keeper for at least one more meal this season. If you’re still in Florida, I hope you enjoy this at least one more time this fall! How far in advance can i make this…need to make for 50 people? This was good but it could use more flavor. The turkey layers are out of this world good, but the pumpkin layer is quite bland. Probably would be good to at least add some salt, and perhaps some paprika.. Also, we added a layer of pumpkin mixed with water on the bottom, as well as drizzled it in a number of places while making the layers. I am totally stealing this recipe. Looks incredible!